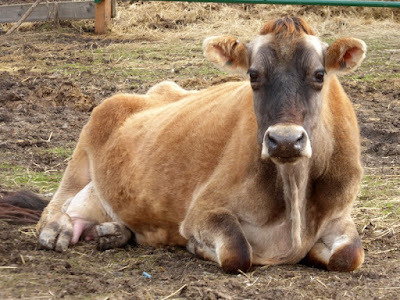 Amazingly, it's been nine years since we brought Matilda home from the commercial dairy herd where she had become a burden. 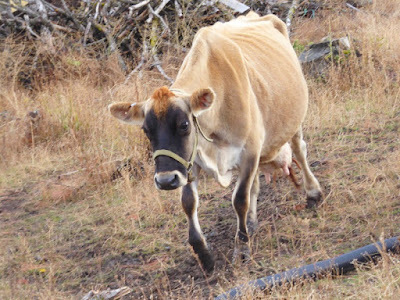 They sold her off because she had scabs on her teats and a raging case of mastitis. Because of these issues, Matilda had a rough start here with us; but throughout the subsequent round of unpleasant treatments, she remained sweet and gentle, a true Jersey in disposition. I blatantly admit she's far more of a pet than livestock. 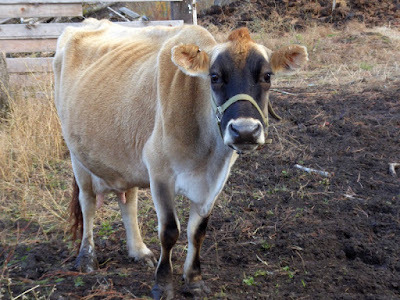 Matilda taught me more about animal husbandry and dairying than all the rest of the herd put together. Nowadays I prefer Polly's milk to Matilda's, but Matilda remains my favorite. We don't hesitate to butcher any extraneous animal on our farm, but Matilda? No way. Oh, I know her day will come, and it won't be too far in the future, but on that day I will absent myself from home and when the meat comes back, it will all be donated to our church's food pantry. And even after all these years, I continue to spoil her, especially in winter. 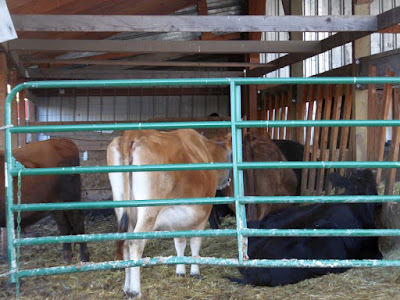 Consider this peaceful scene: All the animals, tucked under the feedbox awning. At the time I took this photo, it was spitting rain and chilly, and everyone was cozy under the shelter. Except Matilda, who has always been at the bottom of the totem pole. While the other critters enjoyed the shelter of the awning and the abundant food in the feedboxes, Matilda stood alone a few yards away. Her gentle, undemanding nature means she never argues back against anyone who wants to push her around. This is why, every winter, I tuck Matilda in the barn each night with her own food. This way I am assured she's warm, dry, and well-fed. Sure it's a bit of extra work to make sure the pen stays clean and stocked, but my peace of mind is worth it. Each evening, just before Don feeds the rest of the beaties, I poke my head out the back of the barn and call, "Matilda!" She's waiting for this call, and starts ambling her way toward the stall. Her 18-month-old steer calf, Sean, follows. Sean doesn't need the food or shelter, but Matilda likes him with her, so along he comes. 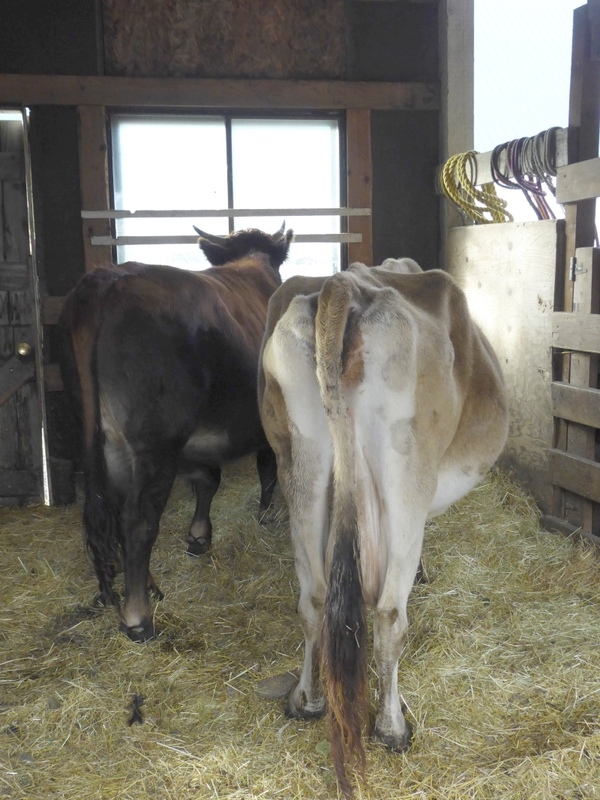 I don't close the stall door behind them; I close the corral gate. That way Matilda and Sean have room to move around the corral without being confined to the stall (plus they have access to the water tank). Sunday morning, when I took the photo below, it was pouring sheets of rain blowing horizontally in a 30-mph gale. 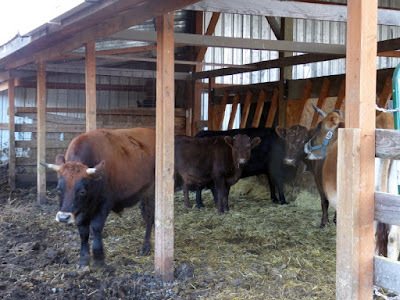 I delayed releasing the chickens since they would just be blown away, but I fed the cattle and horse, all of whom were happily protected from the weather by the awning. Had Matilda been among them, she would have been out getting drenched in the pouring rain and howling wind. 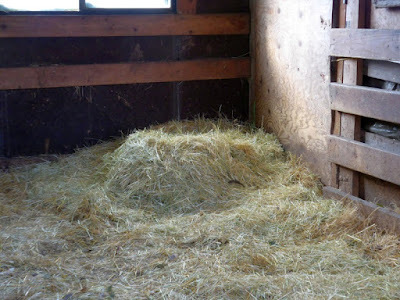 Instead, she was cozy and dry in her stall. Yes. Matilda is due to calve in late January or early February. She loves, loves, loves raising babies, and she produces beautiful calves, so her life's purpose happily continues. I'm not sure how old Matilda is. I know she's at least 15, maybe older. If she'd stayed on the commercial dairy, even if she'd remained healthy enough for them, her useful life would have ended years ago. But here on our farm, she has a purpose and has enjoyed life a decade longer than she might have otherwise. She won't be with us forever -- in fact, probably not much more than a year or two -- so I'll spoil her while I can. Regardless of when it ends, a much better life. I wish everyone would read this. Also, generally, I'm incredibly callous (or so I'm told anyway). I'm the one who can ignore the cries and whimpers of a crated dog who's not accustomed to a crate, if I know the crate is where they need to be. I'm the one who responds to remarks like, "How can you be that callous??" with comments like, "Callous. That's the tough skin on the bottoms of your feet that makes it possible to walk, right?" It's just a matter of logic-- putting what I know is truly good and kind ahead of my feelings in the moment. I don't think I could eat that meat if Matilda were my cow, either. Not unless I had to. That's not callous, that produces a dog with manners. Ours are trained, my SIL babies hers to the point they don't listen and are not housebroken. 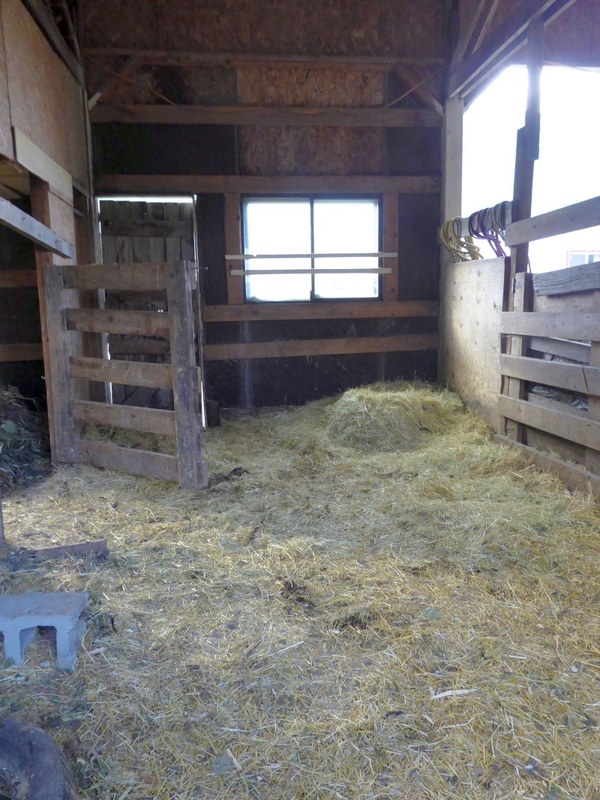 That said, I am supporting 2 elderly mares and 3 stallions that are 20 plus - all will die here. I have driven all night, across state lines trying to save a foal (and spent $$$ doing it). Gotten up every 2 -3 hours to make sure a foal nurses (while working full time in town). That is what people who are in touch with farming and livestock do. Would I give up any of my animals to save a human? In a heartbeat. You CAN treat your animals like gold, yet still be a realist! I have a chicken named blondis. She is so sweet and talks to me every time I go out into the pen. She is past her egg laying days but I keep her for her calm demeanor and because she talks to me. She is probably 7 years old or so now and will be leaving us soon but for now she is the flock matron. I can fully understand where you are coming from! Thanks for the wonderful post on Matilda. Thanks, Patrice, for your tenderness. Some animals have a way of touching our hearts. Wonderful story! Thanks for being such a great care taker of God's creatures! We have a couple of older horses and an older cow, that is a good mama and has beautiful calves, and we feel the same about them. Lord willing they will live out their lives on our farm. She has the sweetest face and glorious big eyes. Know your feelings completely. Our animals are wonderful gifts from God....thank you so much for sharing your loving compassion. Darling gave us beautiful calves. She was a stinker at times but we loved to feed her and care for her massive udder. She was part Holstein and Black Angus. Darling would disappear when it was time to be bred. We would wonder which neighbors bull she would use. 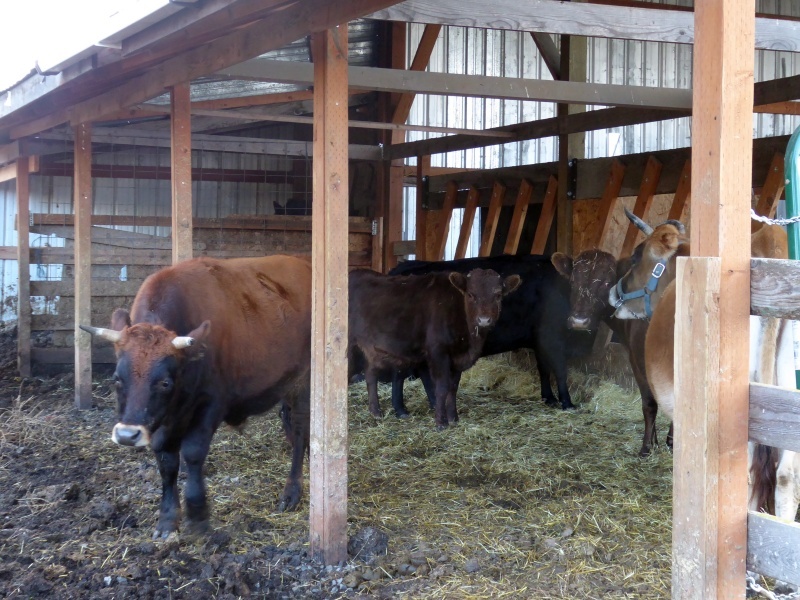 One time she had a small calf and it was her time to be bred and she disappeared for a short time and came back with three bulls. 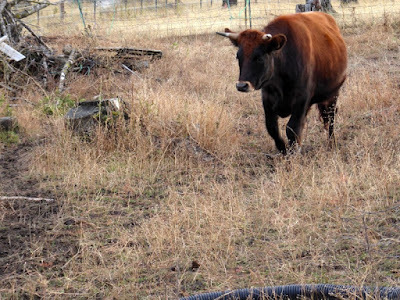 I called the neighbors and found out she came home with the rancher's whole second string of bulls. She was something. We knew she wasn't looking good for a while and planned on calling the vet on Monday. 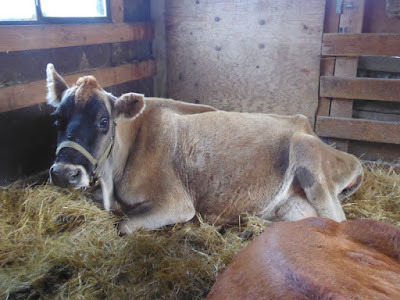 When my husband went to feed her she was laying died in the pasture. 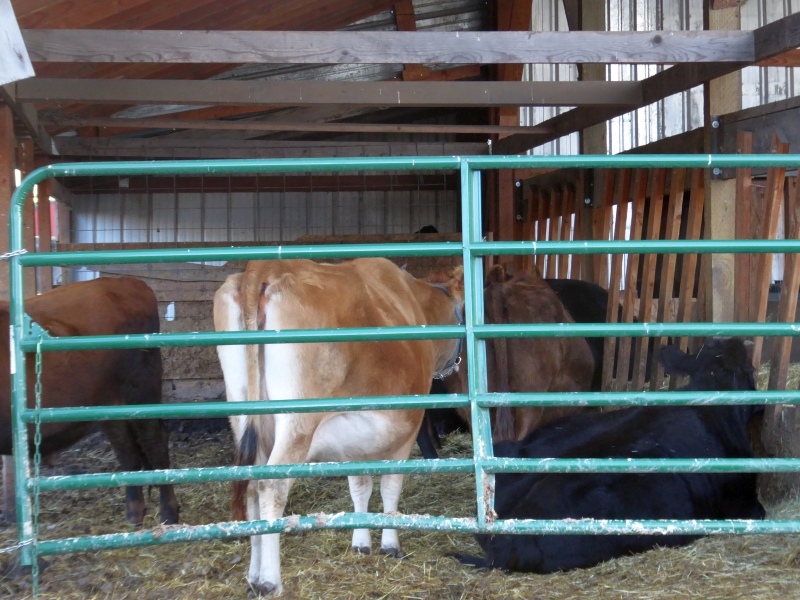 Her two calves ( year old and 3 months old) by her side. Her picture standing belly deep in grass is on the same shelf where the family pictures are. There's always that one who will always be in your heart forever, in my case it was a 4-H calf I raised from birth to his inevitable end. I will never forget him, as I became his mom when his own mom rejected him, I bottle fed him, and worked with him from almost the moment he was born. I have always loved your Matilda! She has always been so sweet and I just love her expressions on her face. I can see why you spoil her and it would be very easy with her disposition. I hope Matilda has many more wonderful years with you. Thanks for being kind. What a lovely testimonial to the power of a single animal and what we will do for them. Thank you. I wonder if cows will be in Heaven? If so, Matilda will most certainly be among them ! My mom had a Jersey, named Patchy, that she favored also. She was such a good mom and even adopted a pair of drop calves that my mom bought to raise for meat. I'm not sure of here exact age, but she was about 20 when she died. She didn't have any calves for probably the last 10 years of life, because we couldn't find a bull for her and she wouldn't conceive from A.I. But she got to live her life out on our irrigated pasture. I have three buff Orpingtons hens that I got earlier this year when they were each a day old. When I got them wife had already informed me they would be pets and would never be taken to the butcher. When I go out to the coop each morning they run up to the gate to be let out, and when I get back home they rush back to be let back in if the gate door has swung closed. Due to their breeding they have a very mellow and docile disposition. We get eggs, but that's about it. And yeah, like others have stated, I wouldn't eat them unless I had to. Guess I'll be burying them in 7-8 years. I am a fool for a Jersey. When my two legged kids were in 4-H the poultry project leader had the members all to a slaughter day. It was a day of learning skills but what my two remember 25 years later is when the turkey was given a gentle stroking by the the husband of this couple lead project . He then told the assembled members " always show respect and gratitude for the critter that feeds you". Granted, had I been born on a farm like my Dad, and not been raised in suburbia, maybe I wouldn't have quite so many pangs of sentimentality about livestock. But darn it, they do tug at your heart strings! There's a simplicity and honesty about an animal, and I do believe this is a leftover grace from God's original design, certainly messed up by the fall, but not entirely erased. In a weird and wonderful way, then, I believe a relationship like you all have with Matilda, makes us all the more human. Am an old man living with my dog in Athol. I spent half the day in church "Reformation Sunday" and nothing touched me as much as reading about Matilda and how you care for her. Many thanks. We have loved her through your eyes for years. Who knew a dairy throw away would be an internet star. I see childrens books about her in your future. I think when you say goodbye I will skip that post. Sometimes the marvelous Creator just gives them something special.